(CN) – A divided Fifth Circuit gave Texas a boost this week in its quest to enforce its voter ID law, staying an order that struck down the law as discriminatory. Senate Bill 5 is a watered-down version of a voter ID law that both U.S. District Judge Nelva Gonzales Ramos and the Fifth Circuit found more likely to disenfranchise Hispanic and black voters than whites. Gov. Greg Abbott signed SB 5 in June and it’s set to become law in January 2018. Gonzales Ramos blocked SB 5 on Aug. 23, finding the potential punishment of up to a year in prison for lying on an affidavit to enter the polls without photo identification too stiff and designed to scare off minority voters, who are more inclined to vote for Democrats: proof it was passed with a discriminatory intent. Texas Attorney General Ken Paxton called the injunction “outrageous” and appealed to the Fifth Circuit in New Orleans, which obliged him on Tuesday with a temporary stay in a 2-1 order. “The state has made a strong showing that it is likely to succeed on the merits. SB 5 allows voters without qualifying photo ID to cast regular ballots by executing a declaration that they face a reasonable impediment to obtaining qualifying photo ID,” Fifth Circuit Judges Jennifer Elrod and Jerry Smith wrote in their 7-page majority opinion. They said a stay is needed so as not to confuse voters and poll workers about election rules, and to maintain the status quo until another panel from the New Orleans-based appellate court can hear arguments on the merits of SB 5. Both Elrod and Smith were appointed by Republican presidents. In dissent, Fifth Circuit Judge James Graves faulted his colleagues for not upholding the injunction against SB 5. He did not agree that Texas has shown a strong likelihood it will prevail, citing the Fourth Circuit’s 2016 ruling in North Carolina State Conference of NAACP v. McCrory, in which the Fourth Circuit held the North Carolina Legislature had purposely crafted a voter ID law to work against Democratic-leaning black voters. “Because the North Carolina voter ID law was passed with a discriminatory intent, it had to be ‘eliminated root and branch,’ and the proposed remediation was squashed,” wrote Graves, a Barack Obama appointee. The litigation dates to 2013 when the NAACP, the League of United Latin American citizens and others sued Texas over its previous voter ID law, Senate Bill 14, and convinced Gonzalez Ramos that there was scant evidence of in-person voter fraud that Texas Republicans said proof of a need for a tough voter ID law. Passed along party lines in 2011, SB 14 restricted registered voters to presenting one of seven forms of photo identification to access the polls. Gonzalez Ramos blocked SB 14 in a 2014 ruling that found it had a discriminatory impact on minorities. The en banc Fifth Circuit agreed with her in July 2016, and sent the case back to her to come up with interim voting rules for the November presidential elections. She approved an interim plan that watered down SB 14 by letting voters bring a certified birth certificate, bank statement, paycheck or utility bill to the polls and sign a declaration stating why they could not get SB 14 ID. 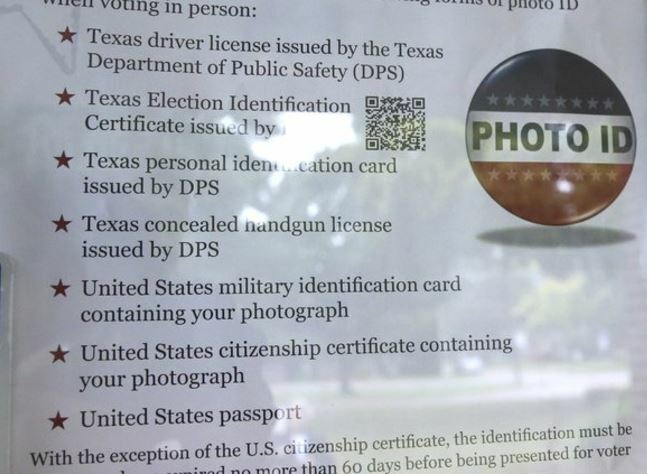 The Texas Legislature incorporated the affidavit process into SB 5 but did not expand the list of acceptable photo identifications, and did away with an “other” box that voters could check on the affidavit and write in a reason for not having state-approved ID. Gonzales Ramos said in her Aug. 23 ruling that the missing other category would make some registered voters avoid voting out of fear that checking the wrong box could get them prosecuted for perjury. The Fifth Circuit stay means the interim rules Gonzales Ramos approved for the 2016 presidential election will remain in place for Texas elections this year. Danielle Lang, who represents Texas’s opponents in the case, expressed confidence Wednesday that the Fifth Circuit will eventually block SB 5. “This is a motions panel determination on an emergency basis and does not reflect any final determination of the merits. Indeed, the Fifth Circuit initially stayed Judge Ramos’s order in 2014 but ultimately ruled against Texas twice,” Lang said. She works for the Campaign Legal Center, a nonprofit Washington firm. “Judge Ramos’ opinion is supported by the record and by the Fifth Circuit’s en banc decision last year and we believe it will be upheld. SB 14 is an intentionally discriminatory law, as is SB 5,” she said. Oral arguments on the merits are scheduled for December. The Department of Justice backed the challenge of SB 14 under Obama, but switched sides after President Donald Trump took office and tapped former Alabama Sen. Jeff Sessions as attorney general. Now the administration supports SB 5, and argued in court filings that a stay is appropriate because it retains the interim order that the parties and Gonzales Ramos agreed on. “We are pleased that the Fifth Circuit has stayed the injunction and allowed Texas to proceed with its duly enacted voter identification laws. Preserving the integrity of the ballot is vital to our democracy,” a Justice Department spokeswoman told Reuters.